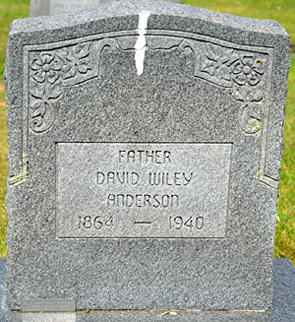 David Wiley Anderson was born on August 20, 1864, in Louisa, Virginia, to John Bledsoe Anderson (1819-1911) and Mary Elizabeth Morris (1823-1893). In the 1850's, John Anderson inherited 1000 acres on the border of Albemarle and Fluvanna counties. It was there that John built a two-story house and several dependencies and raised David Wiley and his 9 siblings. For much of his life, David Wiley Anderson was known as "D. Wiley" Anderson, and he went to school, excelling in mathematics and drawing, and then worked with his father, John, who was a successful contractor. At age 16, D. Wiley was listed as working with his father on the new work on Rivanna Farm in 1880. D. Wiley went on to design and construct well-built and substantial buildings. He clearly admired and demanded fine construction, which may well be a legacy from his father. D. Wiley Anderson married first, Cora B. Marshall on 20 May 1888 in Richmond, VA. Cora died in 1896, and D. Wiley married secondly, Sarah G. Wilkinson (1878-1964), on 30 June 1897 in Richmond. About this time, D. Wiley began a six-year apprenticeship with Richmond builder-architect George W. Parsons. During his apprenticeship, D. Wiley was involved in some level in the design of the library in the Lewis Ginter mansion in Richmond, which was built by Parsons in the 1889-1892 time period. One skill that D. Wiley may have learned as an apprentice became a key to sustaining his architectural practice for forty-five years. That skill was his ability to draw in two dimensions precisely what he wanted built in three dimensions. According to Ashby Sprenkle, a lead field carpenter who worked extensively with D. Wiley in the 1930's, "if D. Wiley Anderson drew it, the structure could be built right the first time. There was no room for error." After a most successful architectural career, D. Wiley Anderson passed away on April 7, 1940, in Scottsville, VA. D. Wiley is buried at Scottsville Cemetery beside his wife, Sarah. D. Wiley Anderson, inventor; bottler and purveyor of Albevanna Springs water; and designer of The Terrace and of Victory Hall in Scottsville, as well as residential and civic buildings from Brooklyn to Georgia, had strong ties to the Scottsville area, where he grew up and raised his family. 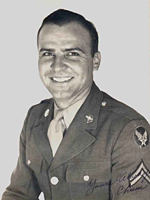 His daughter, Mollie (see ca. 1940 photo of Mollie Anderson at right), was born in 1915 and is now living in Richmond with her son, Keith Van Allen. 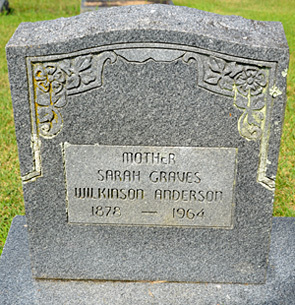 Mollie recently buried her older sister, Patsy (Phyllis Anderson Davis) in the Scottsville Cemetery near her parents' graves. "I get so homesick sometimes," Mollie said. 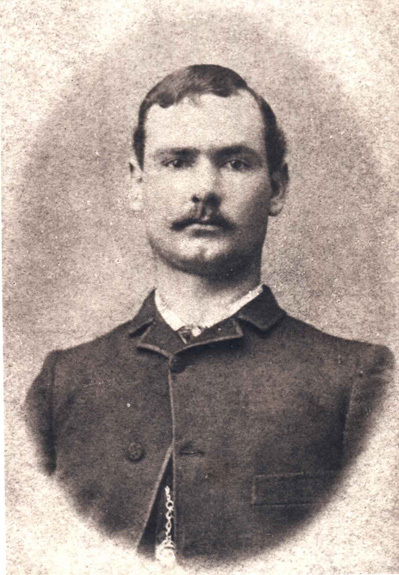 D. Wiley (David, named for his Civil War uncle who later served as a member of Virginia's House of Delegates from Fluvanna County, VA) grew up in the thick of Cap'n John Bledsoe Anderson's clan. Cap'n John Anderson (1819-1911) married Mary Elizabeth Morris in 1843, after his first wife died. Cap'n John inherited about 1000 acres of land on the Albemarle-Fluvanna border along the Hardware River; here he raised D. Wiley and his 10 other children. Much of what we know about this strong-willed patriarch, who always stood by his word--a builder and expert carpenter--comes from his grandson-in-law, Thomas Cleveland Sadler, whose "Memories of Bygone Days" has been often referenced here. The Cap'n was, Sadler says, "very rough-spoken and might scare you to death if you did not know him," though he was in fact a kind and tender-hearted man, for whom religion and music and family were important "Many old houses in and around Fork Union are still standing that he built." John's son, D. Wiley, joined him in this work during the summers, and this was D. Wiley's initial training for his later architectural career. Dr. Susan Frazer, Virginia Commonwealth University (VCU), the first writer to consider D. Wiley Anderson's designs in an academic framework, resurrects him from "obscurity" with her thesis that Anderson, "after being trained as an artisan-builder in rural Virginia and then completing a six-year architectural apprenticeship in Richmond, became an accomplished building technologist, an excellent draftsman, and a competitive regional architect." Frazer, who presented this material at the Scottsville Museum in 1997, says that Anderson's "stylistic evolution" allowed him a long, important career. From his father, we presume, D. Wiley learned drafting and business practices as well as building skills. D. Wiley was a quick student at Scottsville's Stony Point School, always reading; he liked math and drawing. His father's imprint on his work ethic was strong; he taught all of his children the various skills still being employed by the slaves who had stayed on at his family's farm. In 1889, D. Wiley went to Richmond and got a job with architect, George Parson. D. Wiley opened his own business in 1895. 1895 in Richmond was only a generation after the Civil War when Richmond had been ruined and people in the South had very little money. D. Wiley had been exposed to the architecture of Jefferson, and it is possible that he heard Ralph Waldo Emerson speak at the University of Virginia; D. Wiley later took part of a quotation from Emerson as his business motto, "Not a mouse trap man, but the world beats a path to his door." (Build a better mouse trap, Emerson had said, and the world beats a path to your door.) D. Wiley was outgoing and handsome, with entree into Richmond society through Parson and his well-off client, Lewis Ginter, whose mansion he built, and through the Civil War veterans who revered his father. When D. Wiley started his own firm, he designed in the high Victorian style. Several of his three-storey, wrap-around porch, gabled, turreted, and crenellated houses are in the Fan and Hermitage Road District of Richmond, redolent of the elegance of the upper class as Richmond's population boomed. As land northwest of the city was developed, D. Wiley began to add the newer architectural trend, Colonial Revival--- with its symmetry and elaborated front doors, often with the lights and porticoes with columns---to his Victorian designs, including Queen Anne (the painted ladies) and Richardsonian Romanesque (with round-topped arches and square-cut stone work). This eclectic approach, while it has been described as an expression of Anderson's lack of formal training, was very popular at the time, and D. Wiley was offered many commissions from various prominent families in Richmond for large, expensive houses. These homes built by D. Wiley included Montrose, Bleniquahain, and Rosedale. As the twentieth century progressed, D. Wiley Anderson began to design public buildings, churches, movie halls, and train depots. He offered a design in the competition for a new State Capitol in Richmond. While it didn't win, his design was considered impressive and important; D. Wiley used its inspiration later when he designed the Louisa County Courthouse. D. Wiley also designed the wooden, 10,000-seat Exposition Hall for the United Confederate Veterans reunion, a "huge event," says Frazer, and a big boost to his popularity. He also designed a Jewish Temple, movie theatres, and warehouses. Keith Van Allen's favorites include his grandfather's Italianate Confederate soldiers homes in Richmond. Anderson's son, John, worked with his father during this time and was being groomed to take over the business. Keith Van Allen thinks that John designed the small elementary school on Scottsville's Bird Street that burned down in 1981. John was killed in the dreadful carnage in France during World War I, and his loss and its effect on the Anderson family is still remembered by his half-sister, Mollie. Susan Frazer notes D. Wiley's ability to blend stylistic architectural elements and to utilize the newly-available manufactured pieces that could be added to a building according to the client's taste and budget. Perhaps this is how he arrived at his late Victorian commercial design for Victory Hall. As Bob Spencer, lifelong citizen of Scottsville, says, D. Wiley was "of course involved with the idea of having a performance area in Scottsville so the local drama coach, Marion McKay---championed by Scottsville Mayor Jackson Beal--could stage her shows." When silent movies were available, Willie Burgess put in a piano and screened movies, 20 cents a ticket. Later, Chautauqua and travelling vaudeville acts performed there, with many famous entertainers coming to Scottsville. The Victory Hall Company Corporation was founded with banker, Jacinto V. Pereira as treasurer and D. Wiley as one of the stockholders, and "everyone in town was asked to contribute," Bob says. Bricks for the building were made in the John Martin foundry across the James River in the low ground of Snowden just south of the current bridge. The project commemorating the Armistice, began in 1918; the building was dedicated in 1920. "As Mr. Anderson designed it, Victory Hall was like an old opera house. It a balcony and a lovely proscenium. There were 386 seats that folded down ("usually filled on Saturdays," Bob said), and a floor sloping toward the stage. The box office opened to the street, and there was a neon sign While the high school had its senior class plays here," Bob said, "Victory Hall played many roles in the history of Scottsville." Fred Schneider of the Scottsville Architectural Review Board notes, "Victory Hall is clearly the most impressive of the buildings found along Valley Street at this time, the larger braid factory building (at the north end of the street) notwithstanding. Its prominence is due primarily to the building's deeply-recessed arched entry, its most distinctive feature. With this grand gesture to the public, Victory Hall invites us both into the new civic meeting place called the cinema and into the twentieth century itself." 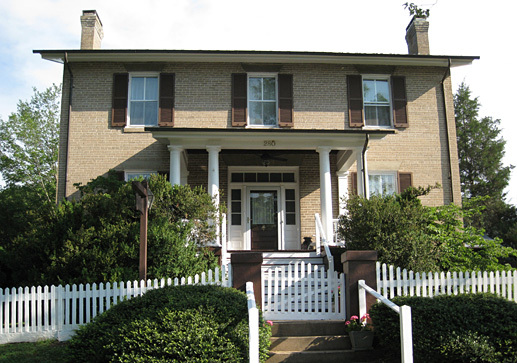 D. Wiley Anderson designed the brick house in Scottsville, called Cliff View, which is owned by George and Lucinda Wheeler and originally built for Senator Thomas Martin on Bird and Page Streets. Keith Van Allen says that Cliff View's interior is a mirror image of the house D. Wiley built for his own family at Albevanna Springs, three miles northeast of Scottsville. T.E. 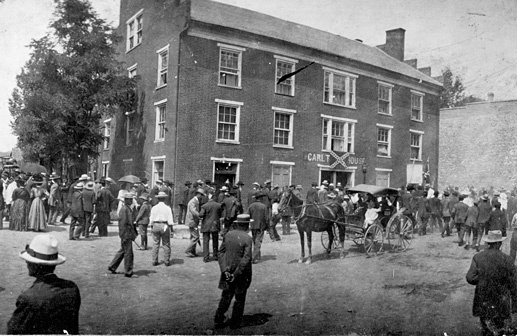 Bruce, Sr., Scottsville pharmacist, asked D. Wiley in the early 1900's to redesign the 1832 Carlton Hotel at the corner of West Main and Valley Streets as his drugstore and soda fountain. D. Wiley also prepared drawings for restoration and additions to Fair View Farm on Rt. 20 in Scottsville; this farm burned in the 1930's. D. Wiley also designed homes for J.L Pitts and W.E. Moon, and for The Terrace, home of the D.P. Powers family in Scottsville. Nearby to Scottsville, D. Wiley Anderson did "a beautiful little church" at Bremo Bluff; 1902 renovations of the Boxley House in Louisa; and Ednam-- his Albemarle masterwork---in Charlottesville. Keith Van Allen says that the Boxley project, transforming an antebellum house into "a charmingly exuberant expression of Colonial Revival, flipping the staircase around, making a wild-flying balcony underneath the grand portion, was one of D. Wiley's most fun jobs." The architect and the owner were "cracking jokes the whole time they worked on it." D. Wiley also designed the mansion in southern Albemarle called Nydrie. D. Wiley's first wife, Cora B. Marshall, died in 1896, and in 1897 he married Sarah G. Wilkinson. 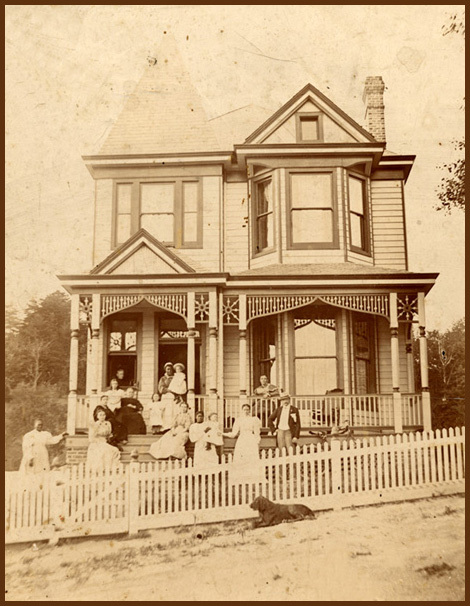 The Anderson family lived in various locations in Richmond during 1900-1913, and then moved to Albevanna Springs. Here Mollie's memories center, as she recalls her ebullient, happy-tempered father and, eventually, 12 siblings and half-siblings, roaming free ("Our mother knew we were safe") on the hills and in the woods. They drove a Model T around the countryside and to Scottsville High School, and also took shortcuts through the woods to walk to Scottsville. They still stopped regularly to talk to "Aunt" Fanny Mundy, who had been a slave on the Cap'n John Anderson property, and whom "everybody loved." Mollie had lots of cousins, who enjoyed the freedom and jollity of Albevanna Springs and often came to borrow Frank, one of the horses. They'd ride him to town, then "pat him on the back and send him home. He'd go into the barn by himself." Mollie remembers the garden in front of the house on the 133 acres which D. Wiley Anderson eventually acquired. Money from one of his inventions, an automatic thermostat window opener, paid for this, Keith said. Mollie also remembers Scottsville High School, where she revered W.D. Smith. 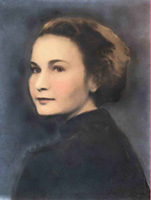 It was there that she met her future husband, Russell Van Allen (see 1941 photo of Russell at right). "Stop looking at me," she told the brash young man. "It's OK--I'm going to marry you," he replied. Mollie went to the D. Wiley Anderson-designed Business School in Richmond, later worked at Buckingham Slate mine, where in her interview, the mine owner learned of her connection to D. Wiley Anderson and said "Oh, you can have the job; he's specified enough of our slate to reach around the world!" Mollie's father would sometimes talk business with her, calling her "my little secretary"
D. Wiley Anderson concentrated on his inventions during the later years of his life. He received 16 U.S. patents, one Canadian one, and was able to attract enough investors to produce his Multifix brick, a flashing brick. He invented a Murphy-type bath tub for crowded apartments and other building-related ideas. Keith says he predicted fast food. D. Wiley Anderson bottled and sold Albevanna Springs Ponce de Leon water from 1911; he was still sending it as far as NC, NY, and Ohio in 1935. Mollie remembers gazing into the pooled water of the nine springs on their property; "Theodore Roosevelt bought that water," Keith said, "when he was at Pine Knot." D. Wiley hoped to develop the property as a "hotel-sanitarium or a large hydro-electric power plant," according to Susan Frazer. However, the Depression had other ideas. Despite his pleasant, joking ways, D. Wiley Anderson fell into debt He went to work as a staff architect for a Richmond production builder, living at his daughter Marie's home while in Richmond, taking the train home to Scottsville on weekends. Sometimes he had to borrow the fare from her. Albevanna Springs was sold out of the family in the 1970's. Lingering memories include D. Wiley and his pet duck under the garden arbor; the dances they'd have in the big front parlor or parties on the lawn with Japanese lanterns lighting the evening. D. Wiley would hunt for frogs in the pond he designed by the spring house, and their cook fixed them for his supper. Anderson would love it when his daughter, Virginia, or any of the family, rubbed and soothed his head when he was home from Richmond on weekends. Keith Van Allen, who has done a great deal to preserve and document the life, work, and legacy of D. Wiley Anderson, recalls, "It was impossible when I was growing up to get a bunch of Andersons together without a barrage of jokes spewing forth, each person trying to top the other. But at the same time, talk of building or scientific study or philosophy could be spouted out equally. All this before eating! Family reunions at Albevanna were wonderful, with several styles of chicken to chose from, then various country meanderings afterward. I miss all of that!" D. Wiley Anderson, Virginia Architect (1864-1940), by Susan Hume Frazer, Virginia Commonwealth University, Richmond, VA; 2001. Ancestry.com, Virginia, Select Marriages, 1785-1940 (database on-line), Provo, UT:Ancestry.com Operations, Inc., 2014. Certificate of Death, Commonwealth of Virginia, David Wiley Anderson; Registration District No. 14a; Registration No. 14219; Date of Death: April 7, 1940; Scottsville, Albemarle County, VA.